Mishnayot, complete set, six pocket-size volumes, "To enable the reader to carry it in his pocket". Part I: Zera'im, Zemanim, Nashim. Part II: Nezikim, Kodashim, Taharot. Amsterdam: Eliyahu Aboab, [1643-1644]. Edited by Menasseh ben Israel. Six volumes. Pocket edition. Two parts divided into six volumes. Separate title page for each part (in this set, at the beginning of volumes I and IV). Eliyahu Aboab leased the printing press from R. Menasseh ben Israel in 1643-1645, which accounts for the mention of his name on the title page, yet R. Menasseh ben Israel presumably continued being involved in the printing process during those years. Several blank leaves were bound at the beginning and end of each volume, and some are filled with Italian script. At the beginning of each volume, a prayer to be recited before the study of that order is inscribed, with related kabbalistic kavanot. A prayer upon completion of a tractate is inscribed on the leaves bound at the end (of most volumes), and a prayer to be recited after studying is inscribed in one volume. A lengthy ownership inscription and prayer at the beginning of the first volume: "Today, Rosh Chodesh Tammuz 1709, I have begun saying the Mishnayot every month… May it be Your will… that these intentions serve to repair all the Names and worlds I have damaged…". The Baraita of Androgynos was copied at the end of vol. I, and two Baraitot relating to tractactes Pesachim and Yoma, at the beginning of vol. II. In the first volume, on the leaf following the title page, owner's signature: "Shimshon Giron". 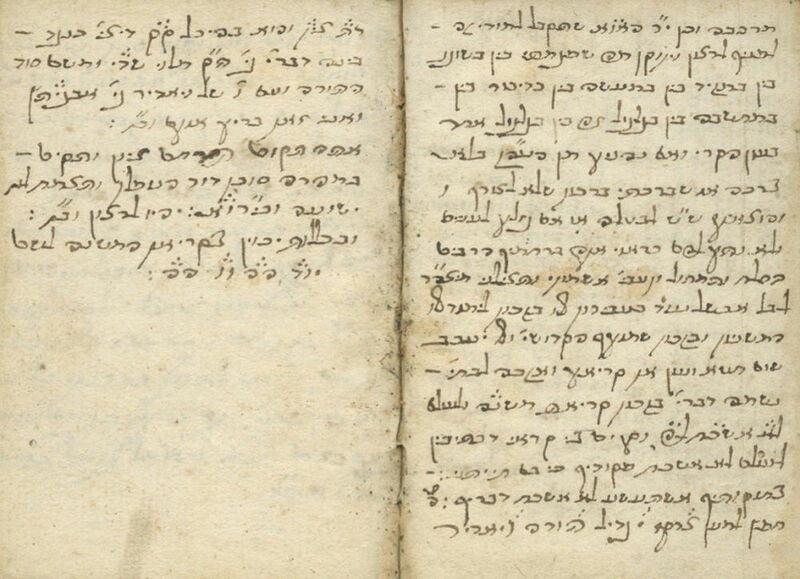 Inscriptions in two volumes, consisting of the letters of the name Yosef combined with the letters of the word Neshama in two different orders (for weekdays and for Shabbat, see: Sefer Zechira, Hamburg 1709, leaf 5). Glosses, marks and vocalization on some leaves. Vol. I: 60 leaves. Vol. II: 61-133 leaves. Vol. III: 134-206 leaves. Vol. IV: 89 leaves. Vol. V: 90-169 leaves. Vol. VI: 170-289 leaves. Lacking  final leaf with index of chapters in alphabetical order. 8.5 cm. Good-fair condition. Stains. Dampstains (primarily to vol. VI). Worming to vol. I, slightly affecting text. Minor damage in several places (including singeing to edges of several leaves). Several leaves with library stamps on text. Old leather bindings, matching. Inscriptions on spines. Minor damage and worming to bindings.